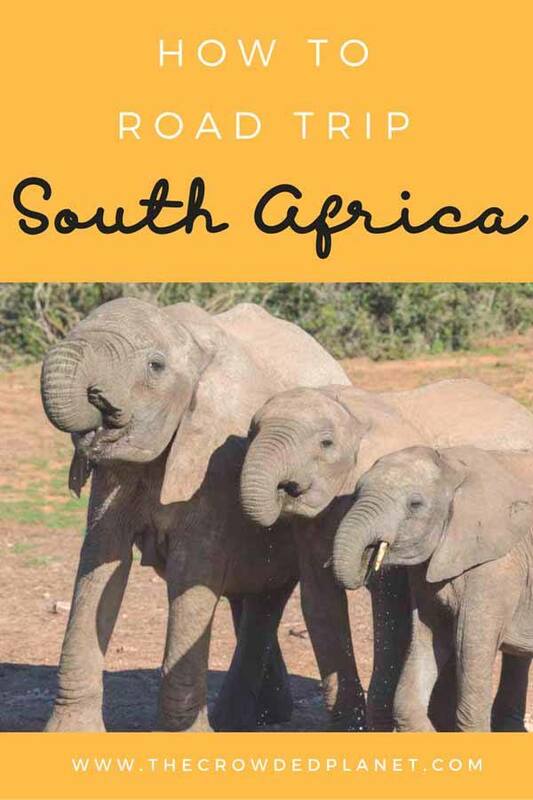 South Africa Road Trip Itinerary - 1 Month in South Africa! Are you planning a South Africa road trip? 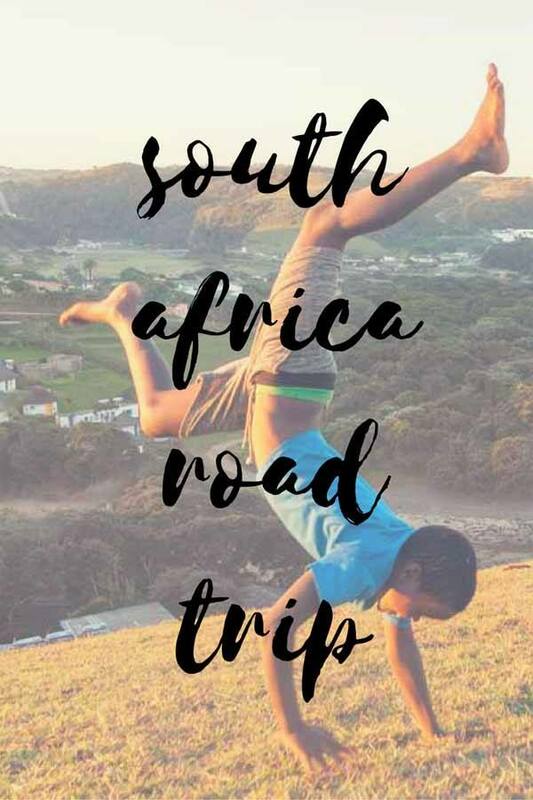 This monster post will tell you all you need to know about our 1 month South Africa itinerary, to help plan your very own South Africa road trip! South Africa is probably the world’s best road trip destination. The roads are (mostly) in great conditions, points of interest are not too far from one another, drivers have great road manners, and traffic in cities is usually ok – with Johannesburg as a notable exception. Driving around South Africa you’ll encounter a variety of sights and landscapes – from stunning Cape Town and its surf beaches, to the Garden Route with its adventure activities, the unspoiled Wild Coast, national parks like Addo and world-famous Kruger and the Drakensberg Mountains, one of South Africa’s UNESCO-heritage sites. Renting a car in South Africa is definitely the best way to move around the country – public transport is available, but tends to connect major cities – and half the fun of driving around South Africa is stopping at national parks, coastal villages, coffee shops and other sights located away from major cities. South Africa is also a massive country, and figuring out where to go and what to see is a very difficult task. That’s why we decided to share our South Africa road trip 1 month itinerary with you, including tips on how to plan a South Africa road trip and how to rent a car in South Africa, and some practical advice on driving around the country. The most popular itinerary for a road trip around South Africa is from Cape Town to Johannesburg, or vice versa. There are pros and cons to doing the trip in either direction – starting in Joburg and ending in Cape Town you kind of ‘save the best till last’, and start with longer driving days. However, Cape Town is a much gentler introduction to South Africa compared to Johannesburg – but from Johannesburg it’s easier to visit places like Botswana and Victoria Falls. Ultimately, driving either way is fine! You can road trip South Africa year round, with every season offering positive and negative points. Don’t forget that South Africa is in the Southern Hemisphere, and seasons are the opposite of Europe/North America. Summer (Dec/Mar) is the hottest time of the year, but it’s also wet and humid in the north – spotting wildlife in places like Kruger becomes hard as animals retreat deeper into the bush. Winter (Jun/Sept) can be chilly, but it’s also the best time for safaris and to spot whales – however, it can be really rainy, especially around the Western Cape. Spring and Autumn are good compromises – we did our road trip around South Africa from late April to late May, a time known in the South African tourism industry as ‘secret season’, with great weather and not too many people on the roads. One final warning – South Africans are frequent domestic travellers so make sure to avoid school holidays when heading to the most famous South Africa points of interest like Cape Town, Kruger or the Garden Route. 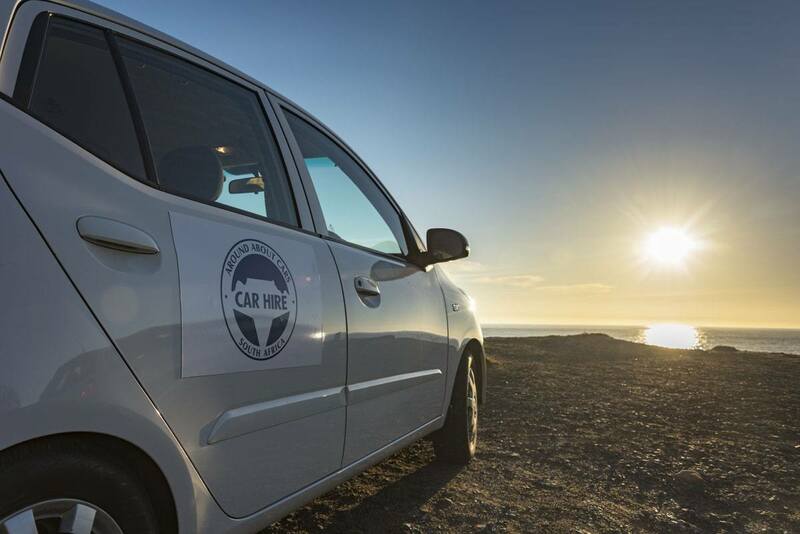 Renting a car in South Africa is simple, straightforward and affordable. We chose to rent from Around About Cars, a Cape Town-based operator that offered great rates even for a one-way rental. Book online to get great deals – we only paid 3500 rand (about €220) for a 26-day rental. Don’t forget to sign up for all-inclusive insurance when you collect your rental vehicle – if you’re planning to drive in the Eastern Cape, roads are in less-than-ideal-conditions, and tire damage may occur. We rented a Kia Picanto, the smallest and cheapest car model. The car was fine to drive along the whole itinerary, as long as you exercise caution on country roads. The boot of the car was quite small but we’re light packers, and we had more than enough space. You’ll need a driving licence (naturally) and embossed credit card to rent a vehicle from Around About Cars. A 3000 rand (€190) deposit is blocked from your credit card when you collect your car, and it is then released about a week after you return it. If you’re planning to drive into Lesotho, Swaziland, Botswana or Namibia, make sure you inform the car hire office before you collect the vehicle, so that specific paperwork can be prepared. There’s a great range of accommodation options in South Africa – from campsites and bare-bones hostels (known as ‘backpackers’ in South Africa) to 5 star hotel and luxury lodges, and anything in between. We stayed in lots of different places, always trying to find something unique. Our accommodation options included an Airbnb villa in Cape Town, boutique hotels, design hostels and even a ‘train’. If you’re planning visit national parks, we recommend booking accommodation INSIDE the park – chalets and cabins are usually moderately-priced and offer the opportunity to stay in the park after closing times. We included tips on where to stay in the description of each road trip stage. If you manage to get a good deal or if several people share a car, road tripping South Africa is quite affordable. As I mentioned above, we paid 3500 rand for our car rental, to which we added approximately another 1000 rand or so for extra insurance. Filling up cost about 400 rand. Most highways are free, with the exceptions of a few toll booths. Accommodation costs varied dramatically, as we stayed in lots of different places – if you’re on a budget, there are lots of great hostels, offering dorm beds for as little as 150 rand and double rooms from 500 onwards. Most hostels also offer cooking facilities and budget communal dinners. A big part of your South Africa travel budget should be allocated to activities – the Garden Route is South Africa’s adventure hotspot, and you can go hiking, canoeing, bungee jumping, white water rafting, surfing, sand boarding, canopying, rappelling… you name it. There are also many private nature reserves offering game drives, but the cheapest way to see animals is to drive yourself around national parks. We started our South Africa road trip in Cape Town, the ‘Mother City’. The city is one of the most spectacular we’ve ever seen, surrounded by ocean and dominated by the mighty frame of Table Mountain. We spent 5 days at the start our road trip, and another 5 days at the end of our three months in Southern Africa, and only managed to see a fraction of Cape Town’s sights and attractions. 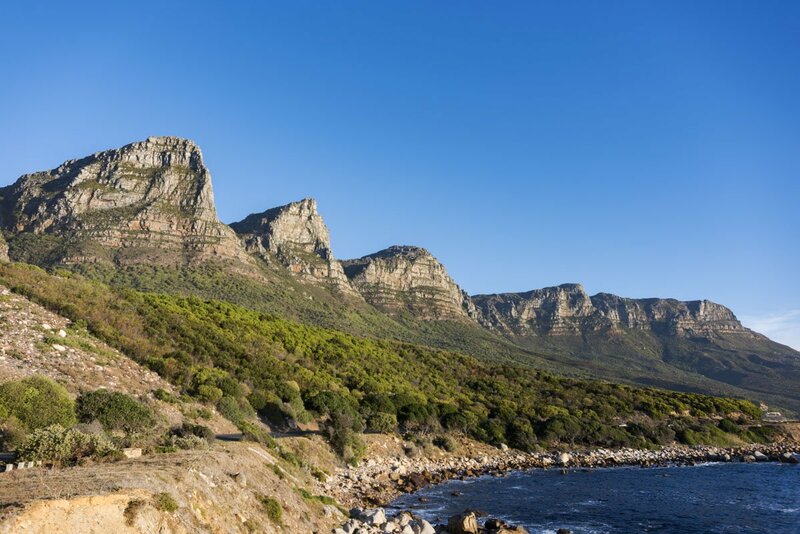 Regardless of how long you have, make sure you go on some day trips from Cape Town to the Cape Peninsula, to enjoy some great nature right on the city’s doorstep. Here’s a quick rundown of what we did in Cape Town during our stay, but trust me, the list is by no means exhaustive! Muizenberg – the city’s most popular surf beach on the Cape Peninsula, ideal for a surf lesson and to visit the famous colourful beach huts. Cape Point Nature Reserve – a protected nature reserve on the southern tip of Cape Peninsula, including Cape of Good Hope, the Cape Point lighthouse and lots of hiking trails. Simon’s Town – the best place to see African penguins. Don’t miss having a swim at stunning Boulders Beach. Kirstenbosch Botanical Gardens – the best place to learn about fynbos, a type of vegetation that is unique to the Cape. This large park is a short drive from the city centre, and there are some hiking trails taking you all the way to the summit of Table Mountain. Bo Kaap – the colourful Malay neighbourhood is a must visit for Insta-perfect shots and to enjoy unique Cape Malay cuisine, product of South Africa’s multicultural heritage. Robben Island – don’t miss visiting the former maximum security prison where Nelson Mandela and many others were held during apartheid. Tours depart daily from the Waterfront and include ferry transport, a bus tour of the island and visit to the prison guided by a former inmate. Long Street – Cape Town’s most famous nightlife hangout, with cool bars and restaurants and a really fun vibe. Table Mountain – you can hike to the top of Cape Town’s most famous landmark, or take the cable car to the summit and hike around the top. We stayed in two different places – this amazing Airbnb villa in Scarborough, a surfer’s town on the Cape Peninsula, and Once in Cape Town, a design hostel a short hop from Long Street. Distance – about 50 km from Cape Town. Not much of a drive, right? Stellenbosch is Cape Town’s fun alter ego, a town with a lively student population and an excellent food and wine scene. It’s the capital of South Africa’s Winelands and a must visit for wine connoisseurs – and even if you don’t like wine, as there’s plenty to see and do. 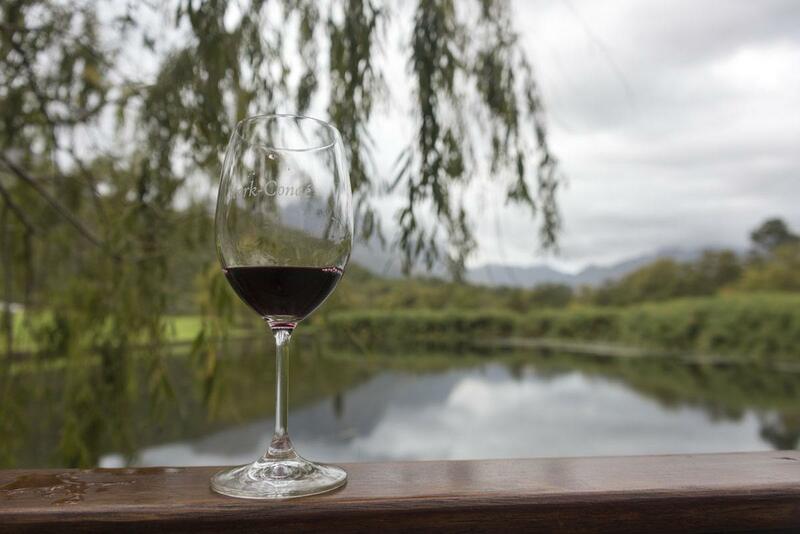 If you’re pressed with time (but you like adventure), a bike and wine tour is a fun way to visit Stellenbosch and the winelands. Other places we recommend visiting are Vergenoegd Wine Estate, famous for the ‘duck parade’, where we had a coffee blending experience, and Middelvlei, where we enjoyed a lunchtime braai and wine blending experience. If you want to learn more about local life in Stellenbosch you can join a tour of Kayamandi, the largest township in the area, including a walking tour and a home-cooked dinner. Check our our Stellenbosch post for more info! 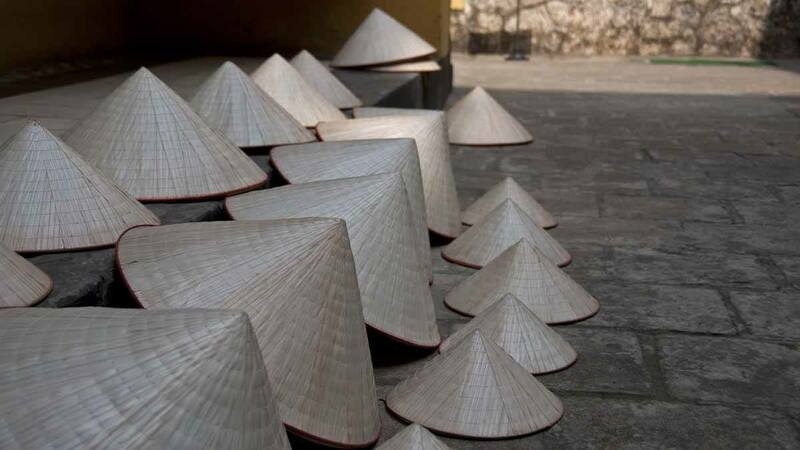 Majeka House is a luxury boutique hotel that won many awards for its eclectic design and decor. If you want to stay on a working wine estate, you can opt for L’Avenir, offering stunning suites with plunge pools on deck and excellent customer service. Hermanus is a cute coastal town, famous for being one of the best places in the world for whale watching during the winter season, when Southern right whales come to breed on the waters just opposite the town. 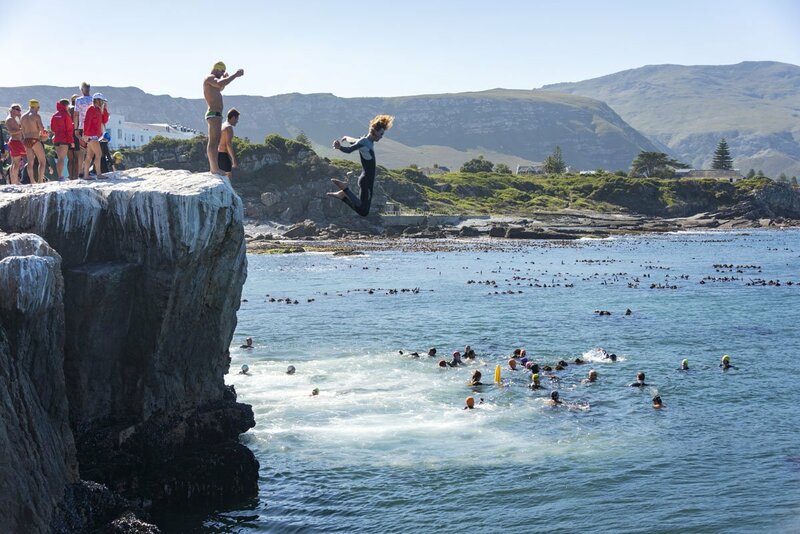 We visited Hermanus for Walker Bay Xtreme, an extreme sports festival held in late April. Even if you’re not in South Africa in winter, Hermanus is worth a visit because of its stunning coastal drives like the Whale Coast Route, hugging the coast from Hermanus to Gordon’s Bay. The Whale Coast Hotel has self-catering apartments in a convenient location not far from the coast. Apartments are comfortable and bright, with a balcony and great views – the apartment we stayed at spelt four and even had two separate bathrooms. The hotel is adjacent to a shopping centre with a supermarket and liquor store, a perfect choice if you’re self-catering. Distance – 140 km direct, 230 km via Cape L’Agulhas (Africa’s southernmost point). After leaving Hermanus, we headed to the Garden Route, the 300-km stretch of coastal road between Mossel Bay and Storms River, including some of South Africa’s top sights and adventure activities. Before heading the Garden Route ‘proper’, we stopped in Swellendam, a lovely country town offering a blend of nature, adventure and rural life. There are two options to reach Swellendam from Hermanus – following the N2, the most direct route, or taking a detour via L’Agulhas, the southernmost point in the African continent. L’Agulhas is a wild place – the world agulhas means needles in Portuguese, after the rocky outcrops all around the cape. Add strong winds and waves, and there you have it – it’s a magical place to stand on, imagining the entirety of Africa stretching behind you. In Swellendam, we spent two days hiking, swimming and kayaking around Buffelsjag Dam and enjoying delicious cuisine – the dinner we had at Field and Fork was one of the best during our entire stay in the country. Other activities on offer in Swellendam include mountain biking around Marloth Nature Reserve, horse riding and microlight flights – we were scheduled to go on one, but sadly the weather let us down. We stayed at Umshanti Cottages, in cute self-catering cottages walking distance away from Buffelsjag Dam. Kayaks are available for free and there are some nice waterfalls a short paddle away. The owner of Umshanti also organises braai evening on a barge sailing around the dam, as well as microlight flights. Mossel Bay is where the Garden Route officially begins. It’s a pretty seaside town with a wide, sandy beach that seemed to have good surf. You can also go sand boarding, hike or ride a mountain bike to nearby Cape St.Blaise, or just enjoy the vibe for a few days. We also recommend having dinner at Café Gannet, a tasty seafood restaurant where we had a delicious tiger roll and salmon parcels in creamy mushroom sauce – another one of our top South African dinners! There are two options to reach Mossel Bay from Swellendam – the first is following the N2 all the way, taking about two hours. A good intermediate stop is Heidelberg, a town with some pretty cool street art. The most scenic option is heading to Oudtshoorn on the R62, one of South Africa’s most scenic roads crossing the Little Karoo, a rocky and desert area. Then you can either stay in Oudtshoorn and visit the stunning Cango Caves, or head southwards to Mossel Bay. We opted for the first route, as it was already afternoon when we left Swellendam and didn’t want to drive in the dark. However, if we went back to South Africa, we’d check out the R62 for sure! To be honest, the reason why we decided to spend a night in Mossel Bay was staying at Santos Express, a hostel located in an actual TRAIN. I’m a train freak and I simply couldn’t resist, so I decided to splurge on a ‘luxury suite’ for one night – a vintage train car from the 1920s, complete with private bathroom and a deck overlooking the beach. Once you hit the Garden Route, deciding where to stop is likely to be a challenge. Shall we check out the sand boarding in Sedgefield? Or the famous Knysna Heads? Or why not evocatively-named Wilderness? Every town and village along the Garden Route seemed to have something special to offer, and one could truly spend weeks exploring it all. However, I’m not a fan of packing and unpacking every day, so we decided to base ourselves in the Plettenberg Bay/Tsitsikamma area for a few days. There’s plenty to do – here’s our things to do in Plettenberg Bay and Tsistikamma post if you want to know more. Some of our favourite activities in the area included the canopy tour in Tsitsikamma, hiking Robberg Nature Reserve and visiting a trio of animal sanctuaries – Jukani, Birds of Eden and Monkeyland. We split our stay between two places – charming Kurland, a luxury property where guests are accommodated in Cape Dutch villas and invited to enjoy afternoon tea and scones by the fire (in winter, of course) and Nectar Cottage, a funky A-frame cottage in the heart of Nature’s Valley, perfect for a secluded family stay. Leaving Plett and heading east, you’ll leave the Western Cape and enter the Eastern Cape province – there’s a tollbooth where vehicles are required to pay a 45 rand toll. At the border between the two provinces you’ll also find the famous Bloukrans Bridge, home to one of the highest bungee jumps in the world. The bridge spans a spectacular gorge, and it is worth a stop even if you’re not jumping – you can just sit with a drink, enjoy the landscape and cheer the daredevils! After stopping in Bloukrans, we powered on to Jeffrey’s Bay, also known as J-Bay, South Africa’s surf capital. We visited in mid-May and the weather was less than ideal for surfing, with some really choppy waves, but we still managed to catch some breaks. We also joined a tour to a nearby farm where we went cliff-jumping and zip lining near a waterfall, and then finished off the day with sunset paddle boarding… which was fun, until the wind started blowing and we had to paddle against the current. In J-Bay we stayed at Island Vibe, the top hostel and surf school right on the beach. We visited in May, when the weather was less than ideal, and the hostel wasn’t at all full – apparently in summer it’s crazy busy, but the vibe can’t be beaten. Island Vibe has an excellent restaurant onsite, serving a selection of breakfast dishes, wraps, pizzas and a very affordable dish of the day. Just one word of warning – if you’re found sitting around the bar in the evening, the staff will invite you to join a game of beer pong, and it might get messy! Initially, our plan was heading to Port Elizabeth – then we found out that Addo Elephant Park was one of the best places in South Africa for a self drive safari, so we decided to head there instead. Addo is South Africa’s third largest national park, but it’s tiny compared to Kruger, over 10 times smaller. On one hand, that makes it easier to spot animals – on the other, there are far fewer animals compared to Kruger. Addo has about 120 km of unpaved roads suitable to all cars, one north-south road and several loops running off the sides. You can drive at will between sunrise and sunset, but when it gets dark you either have to be out of the park, or in your camp area if you’re staying inside the park. We spent one night in Addo, and reached the park in the early afternoon. We spent the first day driving around the southern section of the park, and we spotted several elephants, kudu, zebras, buffaloes and even a honey badger. The second day, we slowly made our way towards the north of the park, driving all the loops we could find – we were trying to find some lions but we couldn’t see any. Instead, we saw several more boks and elephants. If you’re planning to self-drive Addo, check out our post about Etosha National Park in Namibia – the two parks are completely different, but we include some self-driving safari tips which could be helpful. Having booked very last minute, we only found room at Matyholweni camp, in the southern part of the park. We stayed in a ‘Family Chalet’, sleeping two adults and two children in a large room with kitchenette. The chalet had a thatched roof, a nice balcony and braai facilities. All in all, we were happy with our choice! 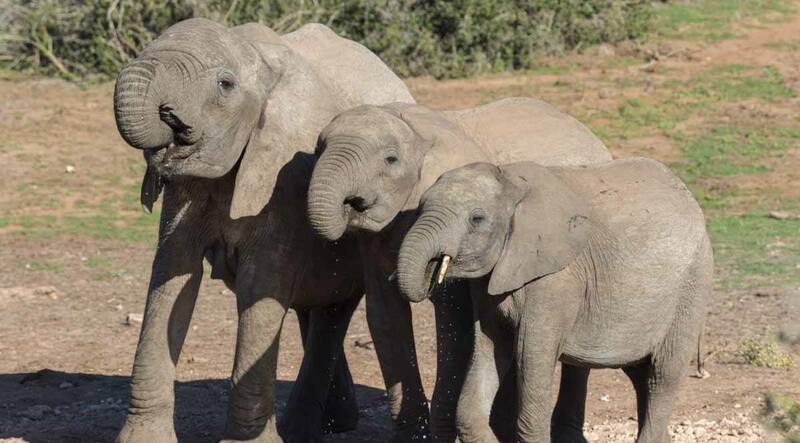 When we left Addo, everything changed. Gone were the wide, well-maintained roads of the Western Cape, with their good asphalt surfaces and passing lanes – welcome to the Wild Coast, the unspoilt and sparsely-populated region between Post Elizabeth and Durban. The region is also known as the ‘Transkei’ – many people will warn you not to visit, citing poor road condition and crime as possible dangers. We totally agree that roads were passable at best, and we didn’t experience any crime. The area was definitely rougher around the edges, ‘wilder’ and with a much more distinct African feel compared to Cape Town and the Western Cape. We really recommend visiting, both to learn about Xhosa culture, and to enjoy wonderful nature. Our first stop was Hogsback, a hippie town surrounded by forests and waterfalls in the heart of the Amathole mountains. The name ‘Hogsback’ comes from the fact that one of the mountains overlooking the village resembles a ‘hog’s back’ when seen from a certain direction – to be honest, I think whoever came up with this idea had one too many. Hogsback is another great place to enjoy adventure. You can hike a multi-day trail over the Amathole Mountains, go mountain biking around the village, go hunting for waterfalls and even rappel down the stunning ‘Madonna and Child’ waterfall. Another cool place to visit in the Hogsback area is Elundini, a traditional Xhosa village where you can learn about traditional culture while staying at Elundini Backpackers, a hostel opened by a local family. We didn’t stay in Elundini, but we spent a day in the village and learnt how to make bread Xhosa-style! Book this place right now! Away with the Fairies is a true dream, a real hideaway in the heart of nature, the kind of place where you just keep extending your stay and never want to leave. There are dorms, doubles, cottages and campsites to choose from, and even ‘Acorn House’, a secluded house away from the main building with a fantastic view over the Hogsback mountains. There are plans to turn Acorn House into a holistic center – I can just imagine it will be amazing! The most famous feature of Away with the Fairies is the cliff bath, a wood-heated bathtub located on the edge of a hill with a real million dollar view. All guests are free to access the cliff bath and enjoy half an hour of pure bliss surrounded by nature – just don’t forget to book your slot as soon as you arrive, especially in high season! Two other great reasons to stay at Away with the Fairies are having a yoga lesson or massage with Miki, the amazing resident masseuse. 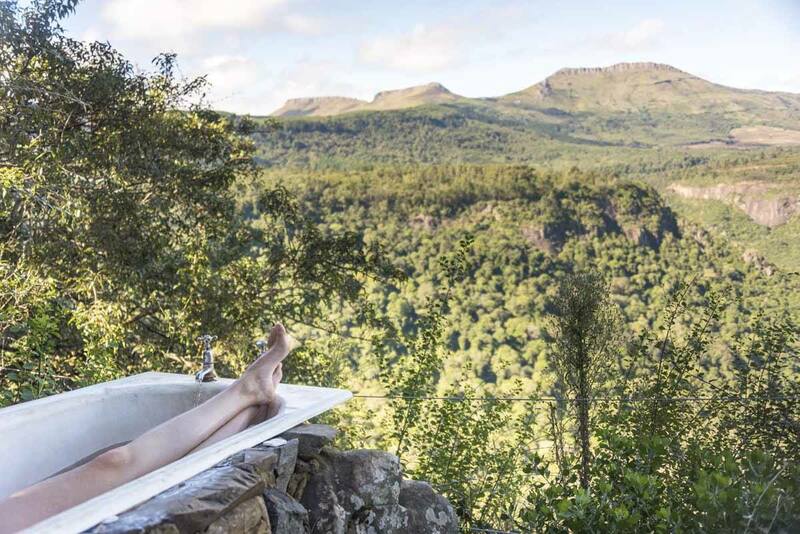 If she’s there when you get to Hogsback, don’t miss booking a massage with her! And last but not least…. PIZZA. The pizza at Away with the Fairies was simply epic. I still dream of it, and I live in Italy. Need I say more? After Hogsback, we headed to the Wild Coast proper. Our first stop was Chintsa, a beachside village about 50 km east from East London. 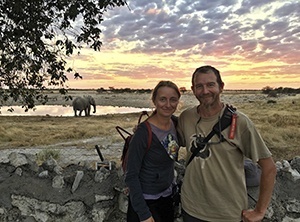 When we got to Chintsa, travelling fatigue hit us and we spent a couple of days enjoying beachside walks, rest and silence – so, unfortunately, I can’t say much about activities in the area. 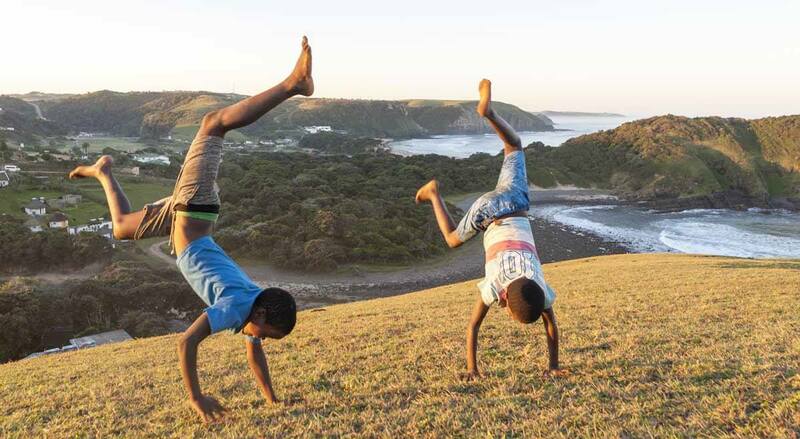 However, if you want to ‘get busy’ during your stay in the region, there are plenty of choices – surf lessons, volunteering opportunities with a local school, Xhosa cultural tours and even visit or stay at nearby Inkwenkwezi Game Reserve – we spoke to some fellow travellers who described game drives as ”phenomenal’. Bucccaneers is an excellent hostel a short walk away from the beach, organising a variety of activities and some tasty communal dinners. Oh, Coffee Bay! That’s another one of those places I’d love to disappear to – kind of like Jericoacoara or Jyrgalan, to give you an idea. Coffee Bay is truly a place to take a holiday from your holiday, to slow down for a few days and enjoy beach life, surfing and nature. The stretch of coast between Coffee Bay and Port St Johns is one of the most scenic in South Africa, and really puts the ‘wild’ into Wild Coast. Roads are further inland, so the only way to move between coastal villages is hiking. 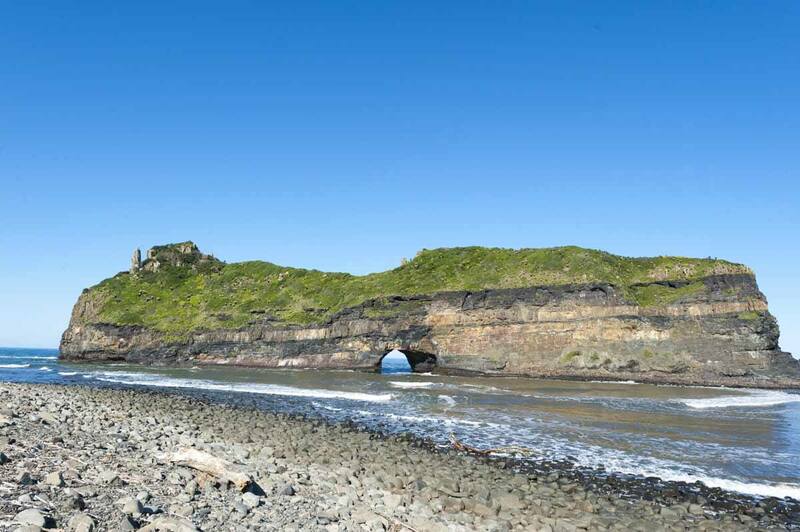 There’s a wonderful 5 day hike that can be done between Coffee Bay and Port St Johns, and a shorter two-day version stopping in Bulungula. 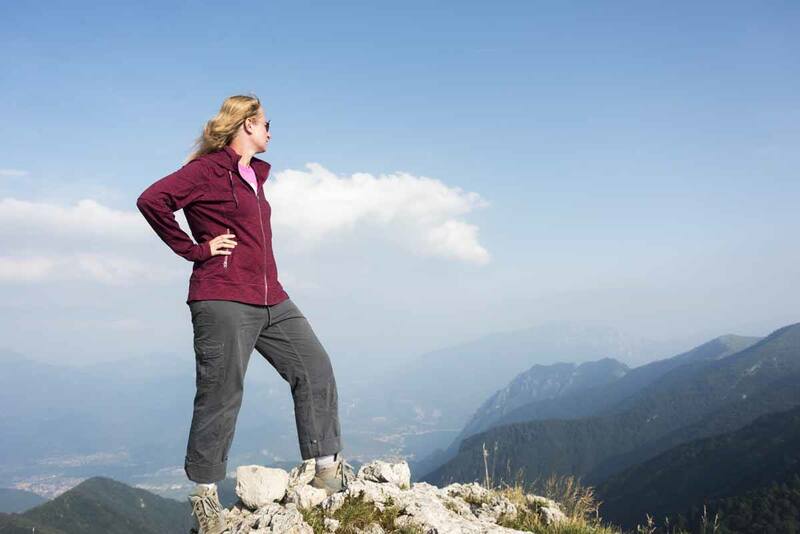 Given our love for long distance hiking, why didn’t we do it? Because we were told that in May, the chances of rain are quite high – but guess what, we had sunshine and bright skies for our whole stay on the wild coast. Things to do in Coffee Bay include surfing – the Coffee Shack, where we stayed, organises surfing lessons for just 50 rand per person, so if Cape Town prices are too high for you, this is your chance! 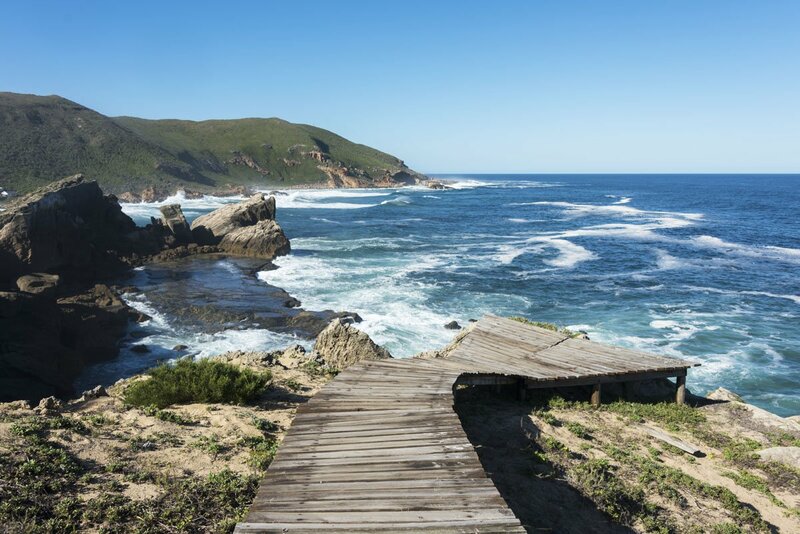 You can also join day or evening village trips to learn more about Xhosa culture, as well as day hikes to the Hole in the Wall, a spectacular rock formation along the coast, and to the nearby Mpuzi cliffs and caves, where you can also do some cliff jumps if you dare! Coffee Shack, where else! This hostel is one of the friendliest places we stayed at during our month-long South Africa road trip, and the vibe is relaxed and welcoming. As supporters of sustainable travel we appreciated the environmental focus of Coffee Shack – visitors and staff are invited to recycle, and management supports several community projects. 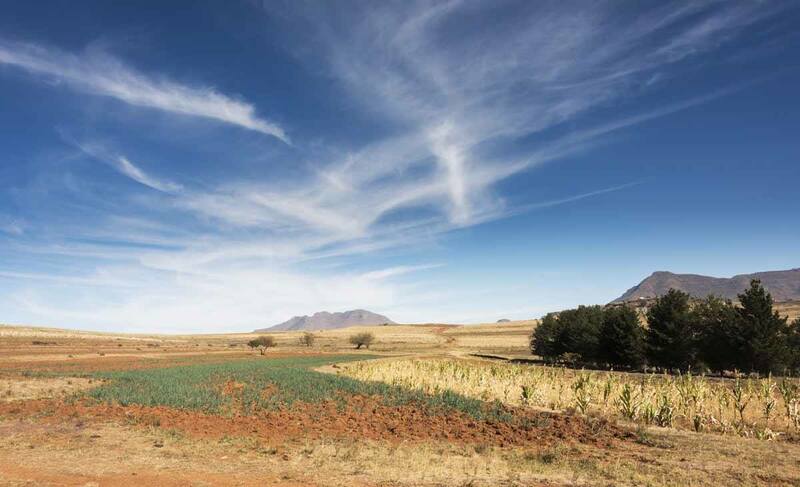 This is the longest drive of the whole trip – in hindsight, it’s probably better to divide it into two stages, perhaps stopping in the vicinity of Aliwal North. If you’re set on wanting to do it in one day, we recommend leaving early – it’s always better not to drive at night, and most border posts between South Africa and Lesotho are NOT open 24 hours. The border post at Maseru Bridge is the only one open round the clock, as far as we know. We used the Van Rooyens Gate border post, open until 10 pm. The most direct route was via the Sephapos border, but it closes at 4 pm and we were too late. Leaving Coffee Bay, head north to Mthatha, then keep heading northwest until you hit a town called Ugie, where you’ll notice mountains looming in the distance. Shortly after passing Ugie the stunning Maloti Route begins, a scenic road that circles around the southern and western border of Lesotho. Follow the Maloti Route all the way to the Van Rooyens Gate border (or Sephapos, if you’re there in time) and then that’s it, you’re into Lesotho. We opted to spend three days at Malealea Lodge, a fantastic eco-lodge running a variety of community projects. You can also hike, go on pony treks or mountain bike rides, with locals as your guides. Here is our 3 days in Lesotho post if you want to know more. Getting to Malealea is straightforward if you follow the directions provided on the website. The last 7 km are on a twisty, potholed, unpaved mountain road, crossing a 2000 m pass – it can be done in a regular car, but please pay attention and try to avoid driving in the dark. After leaving Lesotho, it’s another full day drive to Johannesburg, entering South Africa at Maseru Bridge and then heading towards Johannesburg on the N1. Two tips for this stretch – first, try to avoid peak hours driving around Maseru and crossing at Maseru Bridge, because both Lesotho’s capital and the border post are very busy. Second, try to avoid driving around Johannesburg. Traffic is crazy, and it can be very, very stressful. If you need to drop off your rental car, do it at the airport and catch an Uber or the Gautrain into town. We weren’t sure we would like Johannesburg, and we debated whether or not to stop until the very last minute – then we decided to spend 48 hours in Johannesburg and Soweto, and we’re glad we did. Here’s a quick rundown of what to see in Joburg! Johannesburg CBD – the former centre of economic life in town, all but abandoned in the 1980s, and now being slowly renovated. It’s worth a visit for the strange mix of street markets surrounded by skyscrapers and Victorian buildings. Maboneng – right next to the CBD, this was one of Joburg’s first neighbourhoods to be regenerated. It’s now a hangout for local hipsters and tourists, with artisan coffee shops, breweries, craft markets and lots of independent stores. Braamfontein – this ‘hood has a similar vibe to Maboneng, but it’s located on the opposite side of Park Station, about 15-20 min walk away. We loved having dinner and catching a concert at the Orbit, a super cool jazz club. Apartheid Museum – together with Robben Island and Soweto, a visit to the Apartheid Museum is a must if you want to learn more about this terrible period of South African history. SAB World of Beer – one of the world’s largest beer museums, with a fun exhibition and beer tastings. 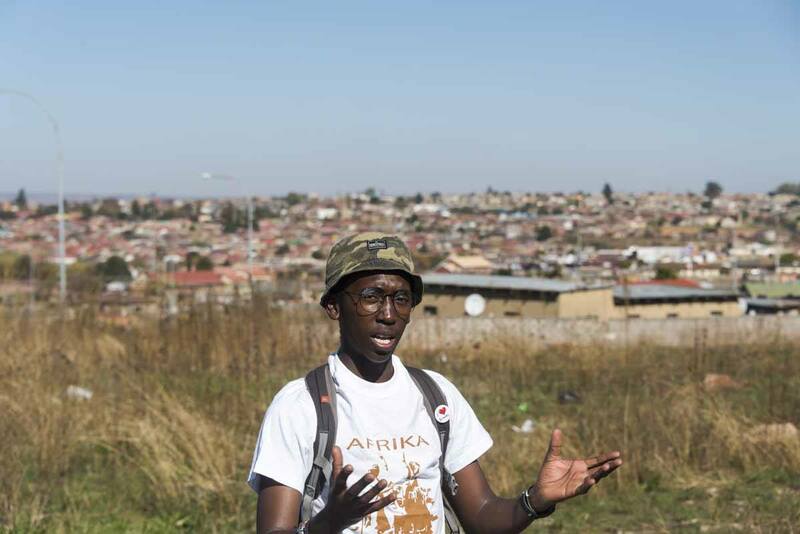 Soweto – whether you opt to stay in Soweto, or just visit for the day, we recommend joining a Soweto bike tour guided by locals – we did the full day tour and loved it. We divided our stay between two different places – Once in Joburg, a cool design hotel in Braamfontein, and Lebo’s Soweto Backpackers, a family-run Soweto hostel that has become a meeting point for the whole community. Lebo’s also runs the Soweto bike tours we recommended. After leaving Joburg, we spent 10 days in the Greater Kruger region where we had a safari/volunteering experience, and we also visited the world’s largest rhino sanctuary. We didn’t include this part of the trip in this road-trip itinerary as we didn’t road-trip there – however, we do recommend visiting Kruger, you can’t miss it! If you have time, we also recommend heading next door to Namibia – we were tired of driving so we opted to overland. Here is our article with 19 reasons to visit Namibia on an overland safari if you needed more convincing! What do you think they’re saying? 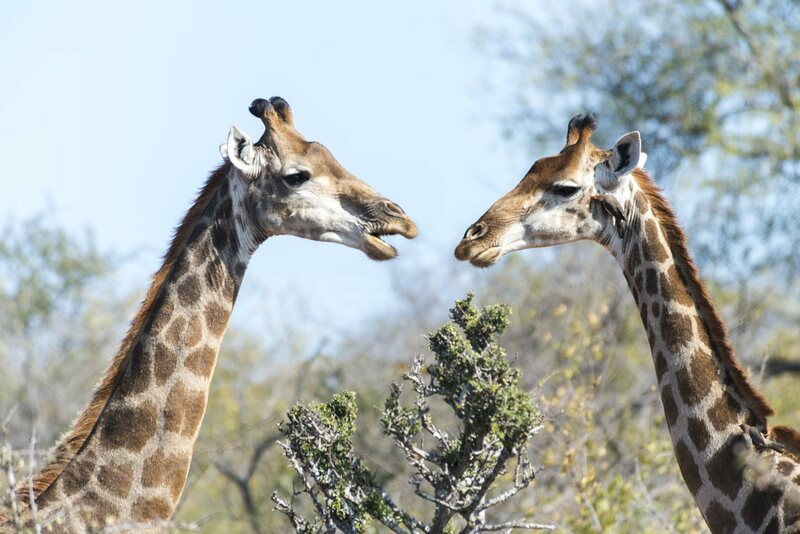 Giraffes in Kruger National Park. Allow for delays – you’ll notice I didn’t give any time estimates throughout this article – that is because driving times around South Africa can vary dramatically depending on traffic, potholes, accidents, road works, road blocks… you name it. Google Maps always underestimates driving time, and so do locals when you ask them – if they say 3 hours it’s likely to take you 5. So, make sure you always allow for extra time! Don’t drive at night – especially in the Eastern Cape. Roads are rarely lit and almost always unfenced, and animals sometimes stray into the road. Have cash on you – South Africa is usually quite card-friendly, but if you stop for petrol or snacks in some remote places cards may not be accepted, or connection might be bad. Having some cash will come in handy. Tip parking guards and petrol station attendants – it’s customary to tip parking guards and petrol station staff after they fill your car. About 2-5 rand is fair – or you can give more if they’re very helpful. Beware of the state of the roads – roads are in good conditions between Cape Town and Port Elizabeth, then they get worse the deeper you get into the Eastern Cape. Get ready for potholes, uneven surfaces and even unpaved roads. In the Eastern Cape, roadworks are also frequent and they’re often accompanied by traffic standstills lasting up to 2-3 hours – make sure you factor this possibility into your driving time. Have your documents in order – there are frequent police checks on the road, and having your driving licence and car documents easy to get will save you a lot of headache. I mentioned it above but I’ll say it again – if you are planning to cross into Lesotho, make sure you let your rental car company know, as they need to prepare extra paperwork. Use a GPS/Google Maps (with caution) – if you’re a map noob like me, having a GPS or Google Maps will help. However, Google Maps is notoriously unreliable in South Africa, so make sure you always double check pin location with directions on your hotel/hostel website. Learn passing etiquette – South Africans are very polite and respectful on the road. If a vehicle is driving slowly, they’ll usually pull onto the shoulder to let you pass. After you pass them, it’s customary to say ‘thank you’ by flashing your hazard lights – the vehicle that let you pass will reply ‘you’re welcome’ with a quick flash of their high beams. Now that you know, try it! Lean the South African lingo – if you ask for directions and the answer is ‘turn right at the robot’ don’t worry, you don’t have to go looking for Optimus Prime – in South Africa, robots are traffic lights! A bakkie is a pick up truck and if someone says they’ll be with you ‘just now’, don’t expect them to arrive anytime soon! We would like to thank Around About Cars offering a discounted rate on our car rental. Some of the accommodation and activities we mentioned were sponsored, others were discounted, and for some we paid for in full. However, this doesn’t influence our opinions. We loved our South Africa road trip, and we miss the country and our friends tremendously. 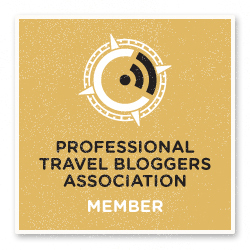 Next Post: Travelling Solo in a Relationship? Why not! However how safe is it ? We found South Africa to be mostly safe. We exercised the same amount of caution as we do in Europe, but we avoided driving at night. WOW What a post!! Very well done. I’m hoping to make it SA next year, and this will definitely come in handy. I love a good road trip, and know it would be amazing. Thanks so much Dave! I am glad you found this post useful.